Yet another tomb of the historical site was dismantled and moved to another place. Hasankeyf, which has a history going back 12 thousand years, will soon disappeared, flooded by the Ilisu Dam, one of the most controversial project in the area. The important historical site has undergone heavy destruction, while some other historical artifacts are moved to new places. The tomb in Imam Abdullah Zaviyesi site was moved to the new Arkeopark: 37 hydraulic jacks and an SPMT vehicle with 256 wheels made the work. The operation of transfer was supervised by police and gendarmery. Murat Dağdeviren, Deputy Director General of the State Hydraulic Works (DSİ), gave the following details about the operation of transfer: "We will carry 5 more works in Hasankeyf, and we will continue the operations here." 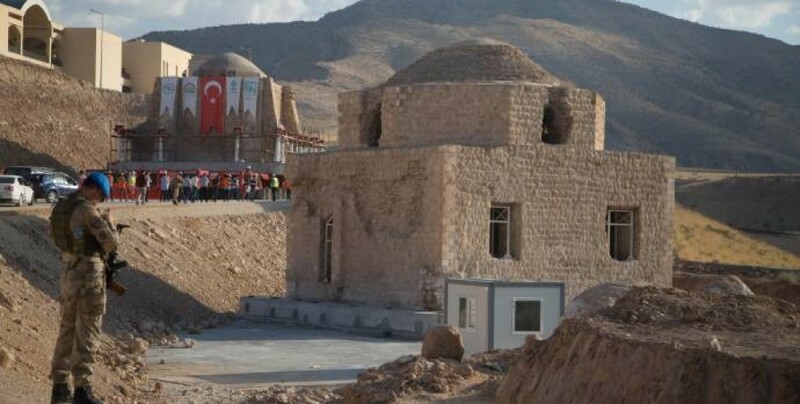 He added that: "There is a Girls' Mosque, there is Süleyman Han Mosque , There is Koç Mosque, there is Al-Rızık Mosque, there is a middle gate, and here we will continue to carry on important architectural pieces, some of which will be preserved in place. We are working to protect the fillings we have made in Dicle Valley and at the same time to protect the caves, it continues in the same way. " The Minaret and the outbuilding part of the Imam Abdullah Zaviyesi will be moved in the days ahead.